Bigger is better when it comes to kitchen and bathroom remodels. That’s the main trend sweeping the country, according to owners of DreamMaker Bath & Kitchen remodeling franchises nationwide. Franchisees are witnessing growing demand for big, open kitchens with large center islands, more refined use of granite and other custom stone countertops, and higher ceilings. Many homeowners are also asking for computer workstations in the kitchen. Master bathrooms are undergoing similar design changes to make them larger — even if that means absorbing adjacent small rooms. Soaking tubs are being replaced, if necessary, by large and luxurious walk-in showers, either open or frameless, with multiple shower heads or more versatile single heads. In most instances, there is an increased demand for more ambient lighting, including large skylights, with standard lighting fixtures, especially fluorescents, quickly becoming history. Shower seats, safety grab-bars and low- or zero-barrier walk-in showers also are becoming more popular as aging Baby Boomers look to the future. 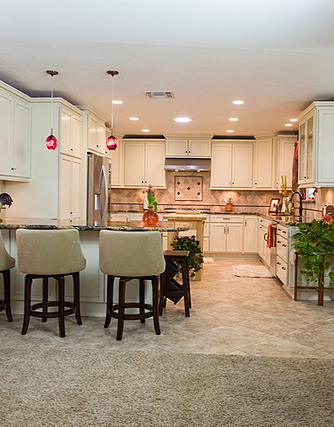 This kitchen remodel by DreamMaker Bath & Kitchen of Manasota makes the room beautiful, and it also makes it a gathering place where friends and family can chat while preparing meals. Jennifer Strohl of the DreamMaker Bath & Kitchen franchise in Bradenton, Florida, says that while most new homes are built with very open floor plans, they still see many homes and condos where the kitchen has a small pass-thru window or is cut off from the other areas of the home. In terms of style, there is a very wide range in tastes and preferences, she continues. This before-and-after from DreamMaker of St. Louis Park, Minnesota, shows how a part of his-and-her bathrooms were combined to create a spa-like remodel. On the West Coast, Patty Gray, co-owner of the DreamMaker Bath and Kitchen franchise in Bakersfield, California, says color schemes are changing, too. Clients also are opening up their living spaces, especially kitchens, she notes, so that cooks can be included in conversations with family and guests. Large islands or a large amount of peninsula counter space is a must for homeowners. Cambria quartz countertops are also becoming a favorite because they do not require the maintenance of granite. She also sees the trend of master bathroom tub/shower enclosures being routinely replaced with large walk-in showers. 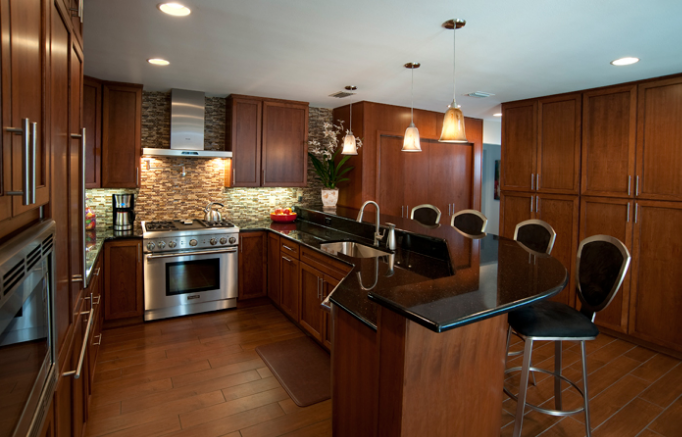 This remodel from DreamMaker of Bakersfield demonstrates one of the biggest trends in kitchen remodeling — opening the kitchen up to the rest of the living space. In Minnesota, DreamMaker’s Lynn Monson of St. Louis Park says he is receiving more and more requests to open up kitchens to the rest of the living areas and to make the resulting open space more multi-use. Clients are asking for larger bathrooms by borrowing space from other areas of the home, especially for the master bath. Heated floors and computerized controls are common requests, he says, as is more natural light in the form of obscured glass windows, skylights or Solatubes — special high-performance “tubular skylights” that bring daylight into interior spaces where traditional skylights and windows cannot reach. When it comes to designs, aging-in-place should be considered by clients even if they are healthy and fit in their 50s and 60s. DreamMaker is a remodeling franchise with dozens of locations nationwide. The franchise system offers several advantages to remodelers — whether they are longtime carpenters or new to the industry — such as national vendor relationships that enhance buying power, carefully designed business plans and marketing plans, training and coaching. Just as important — when you join DreamMaker, you become part of a family of franchisees who share ideas with one another, help each other improve and form friendships. To learn about the DreamMaker remodeling franchise, visit our research pages and download our free franchise report. Feel free to call us, too, at 1-866-734-7006.